Shop, Plan, Cook - With Confidence! 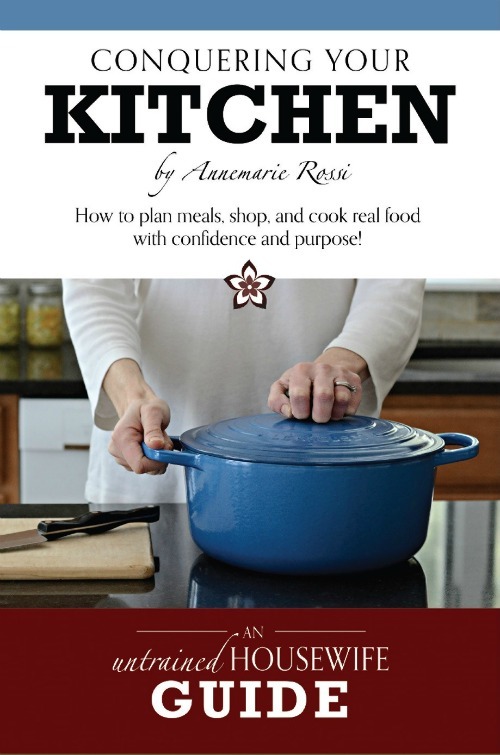 Conquering Your Kitchen, by Annemarie Rossi is the next Untrained Housewife Guide and it’s finally here! You’re going to love this one – if you’ve ever walked into the kitchen an hour before dinner and thought, “What now?” this is the book for you. All of the recipes in the book are able to be prepared in 30 minutes or less. But Conquering Your Kitchen is more than just a cookbook – the book also covers everything else you need to feel confident in your kitchen. From organizing your kitchen, to needed equipment, to how to create a meal plan, sample meal plans to make it easy for you to get started, and more! One thing you need in the kitchen, is the right equipment and we are grateful to our sponsors for making it possible for us to provide some amazing kitchen tools for our book launch celebration. One lucky winner will get a Cutco Essentials + 5 Set with a $634 value and a print copy of Conquering Your Kitchen. A second lucky winner will get a prize package over $280 value with Toscana interlocking cutting boards from Joseph Nogucci, a Calphalon Nonstick Skillet, and a print copy of Conquering Your Kitchen. The giveaway will end July 2 at 11:59 pm so be sure to enter below to win one of these awesome prize packs! Thank you for your on-going support of Untrained Housewife and our print book Guides! Get the Bonus Meal Plans and More! Conquering Your Kitchen is a comprehensive guide that walks you through the steps of how to plan meals, shop, and cook real food with confidence and purpose. Part of the Untrained Housewife Guides series, this book is full of 80 easy, delicious recipes that will help you to look like a pro in the kitchen. Each recipe takes 30 minutes or less to prepare, so you can incorporate these meals and snacks into your schedule even during your most hectic days. It’s never too late to take control of your kitchen and learn how to feed your family homemade food. When the book is released, we’ll be hosting a giveaway with several fun, valuable kitchen tools to help make it a bit easier to conquer your kitchen. Annemarie Rossi is a suburban mom who got tired of feeding her family processed food. She’s the founder of Real Food Real Deals, a website dedicated to teaching people how to eat real food on a budget. She lives in the Boston, Massachusetts area with her husband and two children. Learn more about her here. Did you love the book? Then you're going to love the free resources and charts!